If you’re ready to make a reservation, or if you have a few questions for Tricia, please call, email, or check us out on Facebook. Do you have an upcoming corporate event or wedding? Contact B&B BBQ and Catering to talk about your event. B&B can accommodate up to three events each day, but don’t wait—reserve B&B to cater your event so you don’t miss out on a great meal that your guests will love. B&B BBQ and Catering caters events of every size. From 10 guests to 1200, B&B will work with you to bring your guests an amazing dining experience. Do you have a question? Feel free to contact Tricia, or take a look at the questions (and their answers) below. How large of an event can you accommodate? We’ve been in business since 2005. We started catering small events and working the BBQ competition circuit. Now we provide catering for corporate lunches, small events, large events, wedding receptions, and more. Do you only offer BBQ and the traditional sides? No, we offer a wide variety of items, including desserts. The only thing we cannot offer is fried food. What is provided in the per plate price? 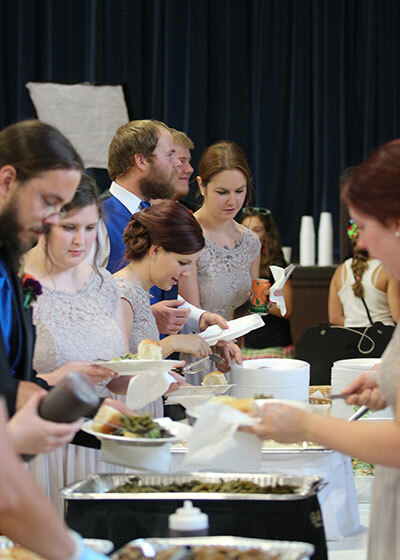 The price per plate includes 2 entrées, 3 sides, fresh made dinner rolls with butter, choice of tea, lemonade or coffee, 10 1/4″ – 3 compartment styrofoam dinner plates, clear heavy duty plasticware, Vanity Fair dinner napkins and our catering service. Can I upgrade my plates or plasticware to clear acrylic or China plates and flatware? Absolutely. That service is offered for an additional fee. Yes, a $100 deposit is requested to hold your reservation. When do you need the final menu, head count, and payment? The menu and head count are due 10 to 14 days before the event. The final payment is due the day of the event. How much do you charge for a whole hog? The price depends on the market price of pork, but contact us and we can let you know the current price.